Allie is a motivated, determined, and responsible attorney with a passion for learning that extends to all of her endeavors. She listens to her clients’ needs, goals, and missions to work with them to tackle any issue. Alexandra A. Mitropoulos (“Allie”) advises and represents businesses and nonprofits on a variety of employment and labor matters affecting not only their day-to-day operations but also their long-term business objectives. Allie works on a wide range of cases and issues, including pay equity, disability accommodations, employment agreements and medical leaves. 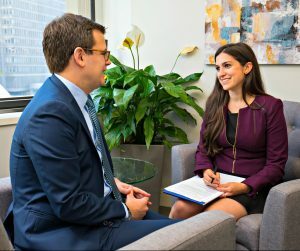 Allie’s practice includes advising colleges, universities and other non-profits on policy, compliance and risk management issues. Allie has particular experience in the areas of campus safety and security, Title IX, the Clery Act, employment based immigration, investigations, the Family Educational Rights and Privacy Act (FERPA), and complex contracts. She defends colleges and universities in an array of litigation matters. 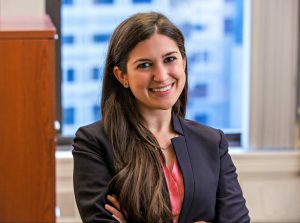 Prior to joining Hirsch Roberts Weinstein, Allie was an associate at Anderson & Kreiger LLP where she represented sophisticated private and public sector clients. As a dual degree student at Boston College Law School and the Boston College Lynch School of Education, Allie served as a law clerk in the Office of General Counsel at Northeastern University and as a legal intern in the Region One office of the U.S. Department of Education’s Office for Civil Rights. She also interned in the U.S. Attorney’s Office in Boston, served as a teaching assistant in the Education Law and Public Policy course, and served as the President of the student group responsible for organizing BC Law’s internal and external advocacy competitions. Upon graduation, Allie received William J. O’Keefe Award for outstanding service and contributions to the community.